The game is designed by the same team that created “Co-opoly: The Game of Cooperatives,” and is an alte rnative to competitive board games that glorify warfare and colonialism. You can play it with your community or co-workers as a team-building exercise, or to explore strategies for social change and grassroots activism. 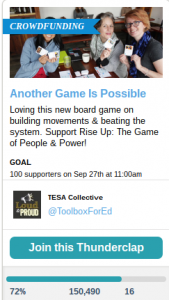 Plus, Rise Up offers two ways to play: the reverse side of the game board features Rise Up Simplified, which is perfect for younger players or for people newer to collaborative board games. The game will be crowdfunded and manufactured by a worker co-operative, bringing the principles of the game full-circle. Want to support the game or get a copy of your own? Check out the Kickstarter campaign and make a pledge, or help spread the word via Thunderclap by signing up to tweet or share a post about the project!